Combine the lentils and 2 quarts water in a medium stockpot and bring to a boil over high heat. Reduce the heat to low and simmer until the lentils are soft (but not falling apart), about 35 minutes. Drain the lentils and allow to cool. Add ¼ cup of the olive oil to a large frying pan and sauté the onions, carrots, celery, garlic, thyme, and salt over medium-high heat, stirring frequently, for about 10 minutes, until the vegetables are tender and just beginning to brown. Add the tomato paste and continue to cook, stirring constantly, for 3 minutes. Add the mushrooms and cook, stirring frequently, for 15 more minutes, or until all the liquid is absorbed. Transfer the mixture to a large bowl and allow to cool to room temperature. Drizzle the remaining 2 tablespoons olive oil into a 9 x 13-inch baking dish and use your hand to evenly coat the entire surface. Set aside. 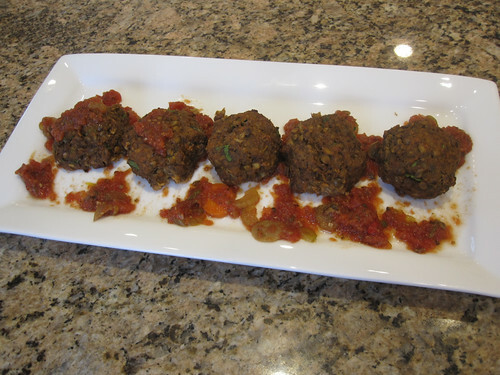 Roll the mixture into round, golf ball–size meatballs (about 1½ inches), making sure to pack the vegetable mixture firmly. Place the balls in the prepared baking dish, allowing ¼-inch of space between the balls and in even rows vertically and horizontally to form a grid. The meatballs should be touching one another. I topped this with store bought salsa but a pesto would be fabulous too. Made them but cannot taste them. Will let you know!